﻿We are now approximately 1 month into the establishment of #18 green and I couldn’t be happier with the results. Thanks to unseasonably warm weather for the last few weeks, the turf has begun to mature nicely and generate new roots. The sod is actually mature enough at this point that I felt comfortable having the Verti-drain go across the green (see pic below) on Monday. 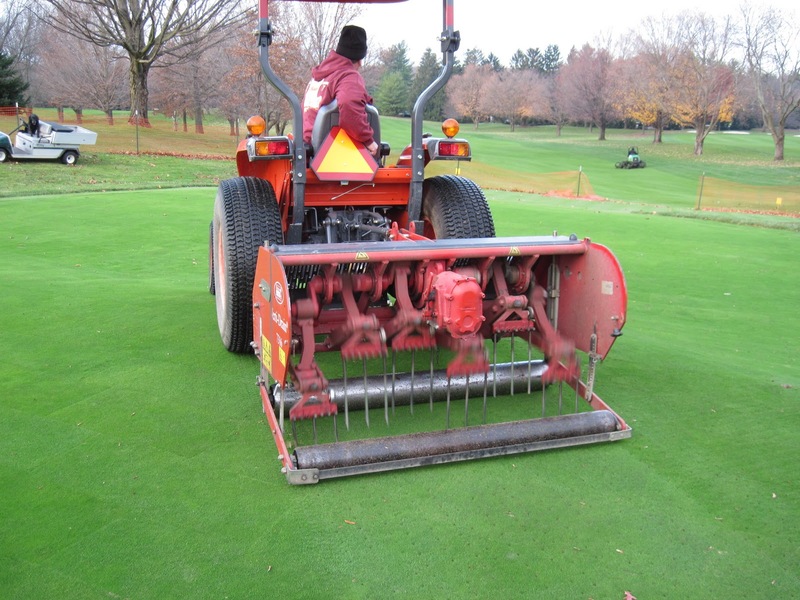 This is an annual process that we perform on the greens each fall just before the ground freezes. Believe it or not, the green was actually mown for the first time this week! As we get closer to the winter months, we will continue to topdress the green to firm and smooth the playing surface as well as protect the plant from the harsh conditions. Depending on when dormancy sets in, an additional application of fertilizer may be applied as well. Just as I mentioned earlier, I am very pleased with condition and the turf quality of the green as we head into the winter months. It is still way to early to predict an opening date as we never know what kind of weather the spring will bring us. We still need the sod to mature more than what it currently is and need a significantly deeper and thicker root mass than what we currently have. This will come with time as the temperatures begin to warm in the spring. Several solid and core aerifications will be performed throughout the spring and potentially another pass across with the verti-drain. Please remember to keep up to date with all of our winter activities by checking the blog on a regular basis.